How does Chinese Strong Diet Slimming Pills control your appetite? Chinese Strong Diet Slimming Pills has one of the active ingredients of Tuckahoe which is proven to relieve hunger pains, or become an appetite suppressant, through increasing the levels of Serotonin. Which acts as a signal telling the body it is full, which results in weight loss, or weight control. How does Chinese Strong Diet Slimming Pills speed up your metabolism? When your metabolism slows down, the body will store fat rather then burn calories, causing an accumulation of fat. If you don't start acting on the first stage of obesity, with time it becomes even more difficult to restore a normal balance, 'cause your metabolic rate and hormone system have been already changed. 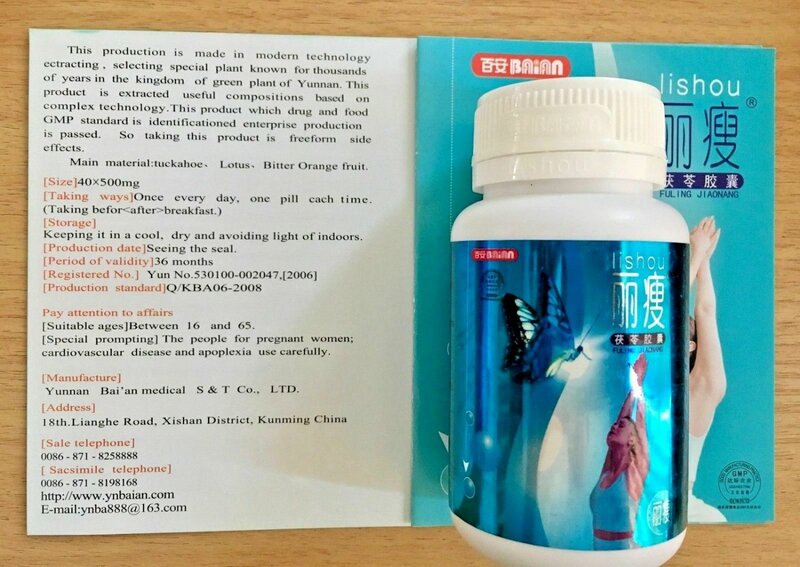 Precise combination of herbal ingredients in shientifically proven formula Chinese Slimming Pills Strong Diet Lih ou promotes thermogenesis process i.e. body's production of heat. Thermic effects causes an increase in metabolic rate (reflected by an increase in oxygen consumption) associated with the digestion, absorption, transport, and assimilation of ingested food. It is collected between July and September. The poria with reddish inner side of the superficial layer is called red poria and the poria with white inner side of the superficial layer is called white poria. The poria produced in Yunnan Province is famous and therefore the drug is also called Yunnan poria Yunling). After collection, it is dried in shade, sliced, and used unprepared. Chinese herbal been used for thousands of years to promote beauty and weight loss. It takes effect right away to help suppress your appetite and burn your excess body fat. Based on the concepts of traditional Chinese medicine, lotus leaf is slightly bitter, and mild, and is attributed to the Liver and Spleen meridians. The main functions of lotus leaf are to stop bleeding and invigorate the blood. As with most other parts of the lotus, lotus leaf is employed to treat a variety of conditions, ranging from hematemesis (vomiting with blood) and hematuria (blood in the urine) to metorrhagia and diarrhea. An active ingredient in lotus leaf, nuciferine, also helps to reduce muscle spasms. Use and dosage: 1 capsule in the morning before breakfast with 350~500cc water. In case of heavy obesity it is possible to add 1 capsule in the evening. ** Maximum daily dose is 2 capsules.